During last week’s football game between the New York Giants and the Cleveland Browns, a dozen of the Browns players decided to kneel during the National Anthem. The action by the football players generated national headlines and added to the controversy ignited last year by former San Francisco 49ers quarterback Colin Kaepernick. The trend was going in the wrong direction for the NFL and its fans but then former Hall of Fame Cleveland Browns running back Jim Brown stepped in. Brown criticized Kaepernick for his on the field activism and advised the current unsigned free agent to choose between being a football player or activist. The former NFL great did not stop there. Brown met with the Cleveland Browns players about their on the field activism and magically all of the players stood and held hands during the National Anthem. With an assist from one of the greatest football players of all time, the Cleveland Browns continued to take a leadership role in sending a message about social justice during the playing of the national anthem Saturday night. Last Monday, a dozen Browns players took a knee in prayer, with a white player joining in for the first time. Before the team’s game against Tampa Bay, nearly 30 players stood and joined hands for “The Star-Spangled Banner,” a group effort made at the suggestion of Hall of Fame running back Jim Brown, who met with players on Friday. According to the story, Brown did not tell them not to kneel or sit but told them to unite. 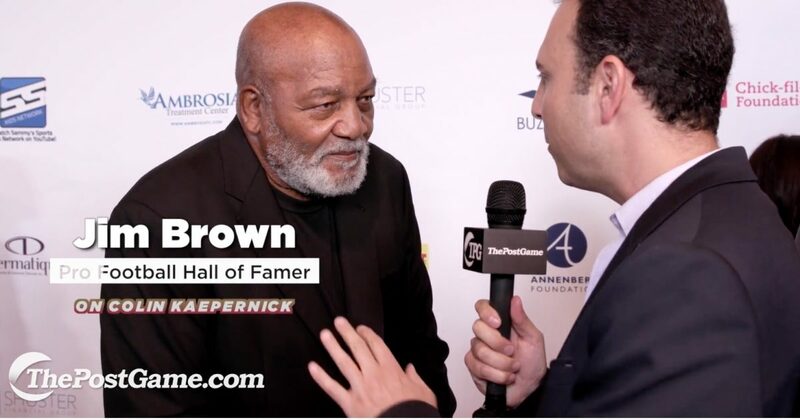 Brown is a football legend and suffered from racial discrimination during the 1960s and he displayed true leadership by providing guidance about social activism to his former team.